Since November 21, and Pamela and Marie's Art Shoppe, I have had an itch to test a recipe I came up with inspired by Fahrenheit 350° Sweet Crunch: Cashew. The New Year beckoned it's arrival. Yesterday offered some disappointing news to end 2008; our hopes of making our new home in Akron, Ohio dashed, for the moment at least, so in our despondency we decided to stay home. While ringing in the new year we vowed to never spend another New Years Eve watching Carson Daly and Ryan Seacrest on TV in Times Square - I ask you, does it get any more pathetic than that? But I love my husband and our little family, so we had a great time nonetheless hooting and hollering and kissing and laughing as we reflected on what is really important. Such as eating cake, and that was our first task of the New 2009 Year! I wanted this cake to taste rich, velvety and buttery, all the things that make you lick your lips with anticipation, and I have to be narcassitic for a moment and brag that I absolutely succeeded. 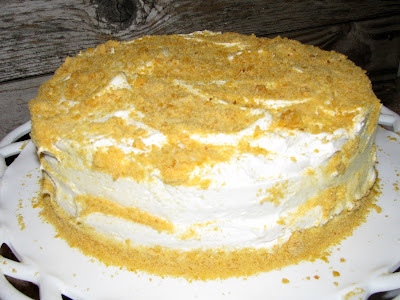 This cake is dense yet moist, rich but not too sweet, buttery and creamy, melt in your mouth goodness with complimentary flavors that make your eyes roll into the back of your head and your tounge lick the back of your throat lameting swallowing that last bite. Excellent! Mix on low until incorporated, and then mix on high for 15-30 seconds. Pour into two prepared 9" round, or square cake pans. Bake for 25 minutes at 350°. Run knife along edges of pan and remove immediately to cool on wire rack. Mix on high until super fluffy and airy, white and spreadable. Cut each cake layer in half, and spread frosting to your hearts content! When finished frosting, pulverize 4oz. Sweet Crunch: Càsh ew, and liberally drape over top and sides of cake. Then, enjoy the heaven you have just created. I have tasted this one and words can not describe it's awesomeness! COULD YOU BE THE MOST WONDERFUL THING IN THE WORLD!??????? YES YOU COULD! 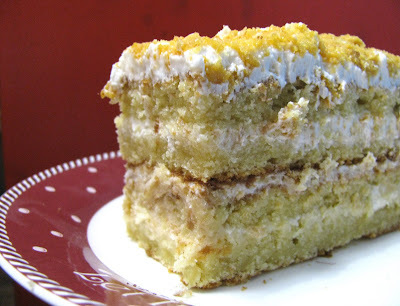 i can't even stand the description of this cake... it sounds soo divine i can't even stand it! and, HELLO! where can i get some of your products?! I AM SERIOUS GIRL! i need to know! i love you so much! i can't believe you are so sweet and sharing this recipe! i am soo excited! BEYOND WORDS excited to try it out! I WISH i were able to ring in the new year with you guys... and dive into such an amazingly AWESOME creation! way to go! you are SIMPLY WONDERFUL!!!! !